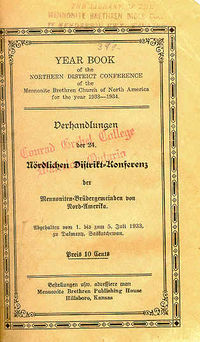 Mennonite Yearbooks (Jahrbücher) are annuals published by Mennonite conferences or individuals, have been of five types: (1) almanacs with some popular religious, literary, educational, historical, or practical material; (2) statistical handbooks giving primarily a directory of congregations, ministers, institutions, and conference organizations and officers, with membership (and financial statistics) with or without some summary reports of the year's church occurrences and activities, sometimes combined with (1); (3) minutes of annual or other conferences (may be called yearbook even though the period covered may be several years), plus ministerial and missionary directory; (4) purely a directory of congregations with membership and ministerial listings; (5) purely literary or historical annuals. Some yearbooks are very small and some large, both in pages and format. Some are distributed free and some sell for substantial prices, and one or two have large editions. One, the Mennonite yearbook, in the 1950s attempted a world-wide coverage of Mennonite ministerial lists and group membership, and had an edition of 12,000. The following list is chronological and not descriptive nor bibliographically complete. The titles of the yearbooks have in some cases changed erratically, as well as has the scope of the coverage geographically, the type of content, size, and place of publication. Naamlijst der tegenwoordig in dienst zijnde predikanten der Mennoniten in de Vereenigde Nederlande, irregularly 1731-1829; Namensverzeichnis der Aeltesten und Lehrer der mennonitischen Gemeinen in Süd-, Ost-, Westpreussen, Lithauen und Polen , occasional, 1823, 1835, 1843, 1857, 1881; Jaarboekje voor de Doopsgezinde gemeenten in de Nederlanden, published by Samuel Muller, occasional, 1837, 1840, 1850; Jahrbuch der Mennoniten-Gemeinden, published by H. G. Mannhardt, twice only, 1884, 1888; Christlicher Gemeinde-Kalender 1892-1941, called Mennonitischer Gemeinde-Kalender 1951-1970, published by the South German Conference; Christlicher Familienkalender, published in Russia by A. Kroeker and later by Raduga 1897-1915, 1918-19; Doopsgezind Jaarboekje, Netherlands, 1902-42, 1949- ; Mennonitisches Jahrbuch 1904-14, published in Russia by H. Dirks 1904-11 and D. H. Epp 1912-14. 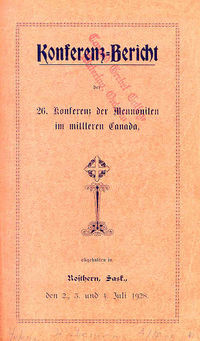 Conference of Mennonites in Canada yearbook from 1928. Mennonite family almanac, later Family almanac at Elkhart, Indiana, 1870-1908, at Scottdale, Pennsylvania, 1909-55; Familien-Kalender at Elkhart 1870-1908, at Scottdale 1909-40; Christlicher Familien-Kalender, published by David Goerz at Halstead, Kansas, 1885, becoming Bundesbote-Kalender in 1886, published by the General Conference Mennonite Conference 1886-1947; Mennonite yearbook and almanac (GCM) 1895-1930, changed to Yearbook of the General Conference of the Mennonite Church of North America 1931-45, then to the Handbook of Information of the General Conference the Mennonite Church of North America, 1946-1998; Mennonite yearbook and directory, later Mennonite yearbook (Mennonite Church), Scottdale, 1905-8, 1913-1997; Yearbook the Central Conference of Mennonites 1922-46; Vorwärts-Kalender, published by the Mennonite Brethren Publishing House at Hillsboro, 1925-43; Der Neue Amerikanische Calender, 1930- , published by J. A. Raber, Baltic, Ohio, for the Old Order Amish, containing a complete directory of Amish ministers; Yearbook, Church of in Christ, 1945- ; Mennonitisches Jahrbuch (GCM), 1948-1957, published primarily for Canadians, described as a successor to Bundesbote-Kalender, quite different in character; Warte-Jahrbuch, published by Arnold Dyck at Steinbach, Man., 1943-44. The Ohio Amish directory, published by Gingerich, Millersburg, Ohio, 1954- , is unique including a complete name list of heads of families along with a congregational directory. This article seeks to describe changes which have occurred since 1959. Titles that have begun or ceased publication are included. The general purpose and use of yearbooks remain much the same. However, attention should be called to a few developments over the past 30 years. The general classification of directory material published by various bodies remains much the same. No official body publishes almanac information along with directory material. Privately published almanacs do contain directory material; e.g., Der Neue Amerikanische Calendar by Raber and its English equivalent. This almanac in revised form was first issued in 1970 and contains Old Order Amish ministerial and congregational directory. (A large number of unofficial local Amish directories have begun to appear [Amish].) European Mennonite yearbooks continue to include literary material such as biographical and historical articles. The titles of these publications have not changed and include words such as "yearbook," "handbook," "directory," or "report." The name depends usually on the content and purpose of the publication. The frequency of publication varies depending upon the publication policy of the respective body. Some have changed from annual to biennial; e.g., for several years in the 1980s the Mennonite Yearbook (MC), even though still contained the word "yearbook" in its title. When minutes of proceedings are included the frequency depends upon the general meetings of the body, whether annual, biennial, or triennial. Frequency also is determined in some instances on the cost of collecting, compiling, editing, and publishing the directory. The purpose and use of these publications remain much the same in that they provide useful information for members, lay leaders, ministers, and personnel in organizations and institutions. The most important change in these publications is the greatly increased amount of information published. Several reasons for this trend are: (1) the growth in the membership, organizations, and activities of the various Mennonite groups; (2) the inclusion of both current and historical statistical material having to do with membership, finances, and enrollments in Christian education agencies; (3) the reporting of information on the inter-Mennonite organizations, such as Mennonite Central Committee, Mennonite Mutual Aid and others; (4) and the inclusion of information on bodies and organizations not aligned with the official body but closely affiliated with it, such as closely affiliated conferences, Christian day schools, campgrounds, publications, and similar material. Examples of this expanded coverage can be found in Handbook of Information (GCM) and especially in Mennonite Yearbook (MC) to the end of the 1990s. A new Mennonite directory for the new Mennonite Church formed by the "integration" of the Mennonite Church (MC), General Conference Mennonite Church and Conference of Mennonites in Canada published from 1999-2001. Beginning in 2002, following the "integration" of the Mennonite Church, General Conference Mennonite Church and Conference of Mennonites in Canada, the new Mennonite Church USA and Mennonite Church Canada began to publish separate directories. In 1999 Christian Light Publications began to publish Mennonite Church Information, which contained data on conservative conferences and congregations formerly listed in Mennonite Yearbook. Three general organizational groupings may be listed as issuing yearbooks and directories: (1) Some congregations issue directories or yearbooks, in some instances containing pictures of members; these directories list ministerial staff, organizations, membership, and activities of the congregation. (2) District and regional conferences, mission boards, and education, publication, and inter-Mennonite agencies also publish directories. (3) Some Mennonite churches in India, Africa, South America, Central America, Japan, and elsewhere, publish booklets containing conference proceedings with or without directory material. (4) Most Mennonite and Brethren in Christ conferences in North America and Europe publish yearbooks or directories. This article is concerned with the fourth group. Gingerich, Melvin and H. S. Bender. "Mennonite Yearbooks and Almanacs." Mennonite Quarterly Review 24 (1950). Mennonite World Handbook (1978, 1984, 1990), lists official yearbooks for various Mennonite groups. Mennonite Directory. Scottdale, PA: Herald Press, 1999-2001. Mennonite Church Information. Harrisonburg, VA: Christian Light Pub., 1999. Mennonite Church Canada Directory. Winnipeg, PA: Mennonite Church Canada, 2002. Mennonite Church USA Directory. Scottdale, PA: Mennonite Publishing House, 2002. Wenger, J. C. "Mennonite Yearbooks." Mennonite Quarterly Review 14 (1940): 59-63. Bender, Harold S. and Ellrose D. Zook. "Yearbooks and Directories, Mennonite." Global Anabaptist Mennonite Encyclopedia Online. 1989. Web. 21 Apr 2019. http://gameo.org/index.php?title=Yearbooks_and_Directories,_Mennonite&oldid=143797. Bender, Harold S. and Ellrose D. Zook. (1989). Yearbooks and Directories, Mennonite. Global Anabaptist Mennonite Encyclopedia Online. Retrieved 21 April 2019, from http://gameo.org/index.php?title=Yearbooks_and_Directories,_Mennonite&oldid=143797. Adapted by permission of Herald Press, Harrisonburg, Virginia, from Mennonite Encyclopedia, Vol. 4, p. 1002; vol. 5, pp. 950-951. All rights reserved.